Love the Big Band Jazz sound? 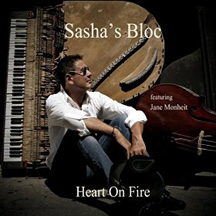 Look no further than Sasha's Bloc - Heart On Fire Featuring Jane Monheit, an 11-track release of original music by bassist, songwriter Alex Gershman that pays tribute to the Jazz of the 1920s, 1930s, and 1940s. Put on your dancing shoes and get ready to dance and romance as you listen to this gorgeous release. Sasha's Bloc Heart on Fire Featuring Jane Monheit was produced by Joe DiBlasi and co-producer Bob McChesney for the AG Entertainment label. This is the second release by the Jazz collective Sasha's Bloc founded in 2012 by the talented bassist and songwriter Alex Gershman and features all original material written by Alex Gershman. Along with his core band, Nora Rothman, Brandon Fields, Alex Budman, Bob McChesney, Kye Palmer, Kevin Winnard, Steve Cotter, and Andy Langham, joining Alex on the release are featured guests Grammy-nominated vocalist Jane Monheit, James Lum, Patrick Tuzzolino, Alvin Chea, Glynis Leflore, Princess Fortier, Octavia Pace, Jason Fabus, and Marc T. Bolin. The 11-track release opens with Lonely Day in Paris dedicated to the late Frank Sinatra (1915 - 1998) that starts out with a drum roll and brings on the horns section then segues into a piano romp which sets the pace for this big band sound with vocals by Patrick Tuzzolino, followed by Feels Like Jazz featuring Jane Monheit who sings and scats her way through this catchy, up-tempo song with a 1920s -1930s Cabaret feel. Next in the line-up is the playful Anything is Possible a Dixie style, New Orleans Brass Jazz song with great harmonies by Nora Rothman and Patrick Tuzzolino. Alex and the band slow the pace with the heartfelt ballad, Black and Blue featuring vocals by Alvin Chea and Glynis Leflore. Jane Monheit returns to lend her luscious vocals on the songs, Breakfast with is decidedly New Orleans big band Jazz feel with Jason Fabus on accordion and Marc T. Bolin on tuba, that will make you "hungry," the title track, Heart on Fire, and the slow and sassy Sunday Blues, composed as a classic 1930s Jazz Blues song. Take a Chance has a wonderful instrumental intro before segueing into Nora Rothman's captivating vocals. Patrick Tuzzolino returns to lend his vocals on Angel, with lovely backing vocals, that conjure up images of Fred Astaire and Ginger Rogers dancing to this lively song perfect for tap, lifts, and twists of ballroom dance. The Duke is Sasha's tribute to the legendary pianist, composer, bandleader Duke Ellington (1899 - 1974), and opens with a dramatic piano intro by Andy Langham. The last track on the release, Manhattan, evokes the 1940s and the sound of the Andrew Sisters with stunning vocal harmonies by Glynis Leflore, Octavia Pace, and Princess Fortier. From start to finish, Alex Gershman and his band, Sasha's Bloc, bring on full-blown romance at its very best with Sasha's Bloc Heart on Fire Featuring Jane Monheit; it is a fabulous release. Websites where you can procure Sasha's Bloc Heart on Fire Featuring Jane Monheit are SashasBloc.com, and Amazon.